I have used a pressed four-leaf clover as my bookmark for several years. Does anyone else have quirky bookmark? I don't have a quirky bookmark. My bookmark is usually just a scrap piece of paper. I tend to use any bus ticket, unused tissue, receipt or other small piece of paper that is on hand once I start the book. I lose bookmarks too frequently to imbue meaning in them. I'm terrible - I usually just fold the corner of the page down. My children tend to get their hands on my books and any bookmark is very quickly lost...and trying to find where I was up to is tricky! Even if I'm reading a book on the tablet my daughter will often manage to get in and lose my page! I use bookmarks, but I don't have anything quirky. 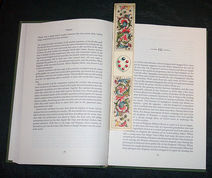 A book mark just marks the page..... So I use ripped bits of paper, proper book marks, receipts or envelopes!!! I have a lovely collection of bookmarks that I keep in one of those boxes that looks like a book on my shelf. My collection began when I was working in schools and I received a couple made by the kids I worked with. They're precious to me. Whenever friends or colleagues want to buy me a gift I ask for bookmarks. That way it saves the embarrassment of asking for something considered too difficult or expensive for them, and it adds to my lovely collection. 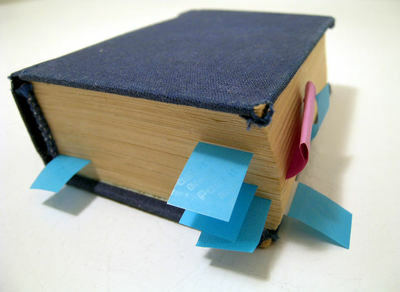 For reference books I tend to use post-its. Yes - I always use a bookmark. I don't like to turn corner of books down as I think you are defacing the book by doing that. I've a big collection of bookmarks! To turn down a book page is anathema to me! If I get a Library book, & this has happened, I press the crease, to try & eradicate it. about to page turndown, I'd give them one of my spares, such is my hate of that action, to a book! I was taught by my Parents' to respect books, so it is to this day that I do, & will forever. If I have a big collection of spares, I give them to my local Library, as they give them to less fortunate folk, who are house-bound. I often see a 'card' that's beautiful, so I buy it as a bookmark, & keep it in its' cellophane cover, to stay clean! At the moment, my bookmark is the 'label' from 'on hold' book from Library! Probably the simplest I've used for ages! Yes, always. I get many different picture ones, from the NSW state library, so I have a pile of them. I also use recycled 'stickers' which I use in my recipe books from our investment person, which say: 'Sign here' on them!